Properties in Convento de las Mercedarias average 4.6 out of 5 stars. Garden, swimming pool, private parking, wifi, pool, air conditioning, central. Property 3: Garden, swimming pool, private parking, wifi, pool, air conditioning, central. 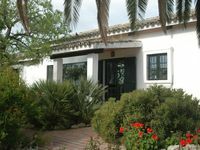 Property 14: Cottage "Casa del Huerto"
Property 24: Sierra de Grazalema, 2-7 people, village center, pool, garden, wifi. A lovely home, photos don&rsquo;t do it justice. We stayed here during a rainy spell in early April, so didn&rsquo;t get to enjoy much of the many garden areas. House is very well equipped and the owner Joaquin was very welcoming. We did have a problem with the electricity the first night we were there. Flashlights and candles with holders would be a good addition. Joaquin responded to all our concerns. We enjoyed being out in the country, within easy driving distance to the Pueblos Blancos. Enjoyed three wonderful days at the wonderful retreat in the farming area 10 minutes outsside of Jerez. Blanca has excellent taste, and added touches that made the stay very &lsquo;homey&rsquo; and comfortable. At her suggestion we ordered a delicious meal from Chef Marmole which was delivered to the cottage. Very close to an excellent vineyard &lsquo;Bodegas Luis Perez&rsquo; which is also a must visit. Sitting by the pool drinking wine was a great way to spend the afternoon. 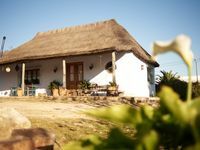 You will need a car and you are on a farm complete with dogs and roosters but the staying was the most relaxing and enjoyable portion of our two weeks in southern Spain. We will be back! !